This year I am getting ready early! In fact, I have had Christmas on my mind for a while... especially the tree decorations. 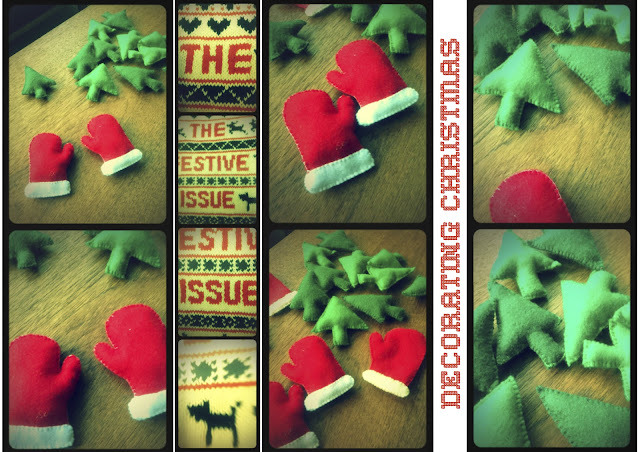 Fueled by some great books and inspirations I have made some Felt Xmas trees and Gloves. Some Crochet Baubles (more on those later). 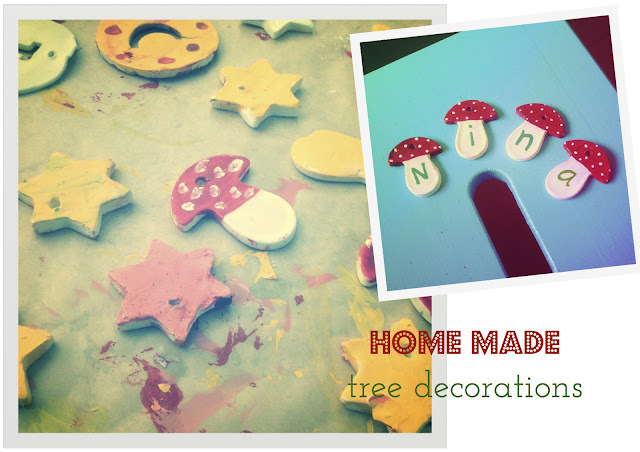 And some homemade clay stars and toadstools. Combine the cornflour, bicarbonate of soda, and water in a pan. Stir this mixture over medium-low heat. After a couple of minutes, the mixture will begin to thicken (like smooth mash potatoes). Remove the pot from the heat. Spoon the ball of dough into a bowl and cover it with a damp cloth until it's cool. When it's cool, knead it on a smooth surface, adding a little more cornflour if it feels sticky. Preheat oven to 80 degrees C. Line baking sheet with baking paper. Roll out clay to 1/4 inch thick on a surface lightly dusted with cornflour. Use cookie cutters to cut out shapes. Transfer shapes to the prepared baking sheet. Use a straw to poke a hole in the center top of each decoration. Place them in the oven for about an hour, turning them over halfway through cooking. Be careful not to burn them (they will lose their whiteness and turn slightly brown). Paint and varnish them a your own pleasure. It's a super smooth clay, which is just such fun to make and play with.